Hint: It'll be more than a day. haha yeah. i need to start selling off everything so I can buy all the new stuff. today's the day the engine finally came out though. still plenty of work to do. Attempted again today to finish installing my new DPI aluminum radiator and DeloreanGo cooling fans and shroud. The new radiator looks to be a fantastic piece of hardware. Had some issues with the new fans and shroud. One of the new fans was damaged in shipping and the folks at DeloreanGo immediately sent a replacement that arrived earlier this week. After I swapped out the damaged fan for the new one, I attempted to bolt up the new shroud to the new radiator. No luck there. It seems the new shroud is about a half to three quarter inches too short. You could either line up the top two mounting holes or the bottom two mounting holes - not both. 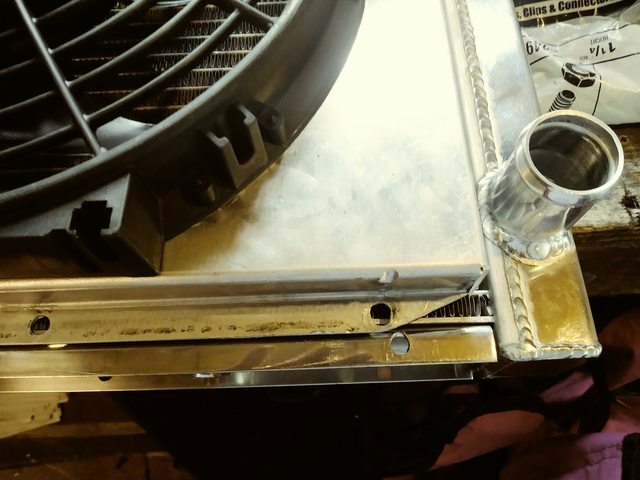 I ended up lining up the top two holes for the radiator support brace (106851) and mounted them, and then took a 27 inch long piece of 1 inch wide aluminum flat bar stock and drilled holes in it to line up with the holes in the radiator. The aluminum bar acts as a clamp and holds the bottom of the shroud against the bottom of the radiator. Got everything done except the three bolts on the left side radiator bracket before I had to quit for the day and go to work. I should be able to finish it up tomorrow. I'm seeing now the PO may have removed the passenger side clamp for the coolant pipe as it chewed a hole through the old intake. What are other owners doing to prevent this from rubbing? Fixed oil pressure light sender oil leak on driver's side of engine block. Was quite an effort to obtain a 23mm socket with proper connectors to permit removal and tightening. Before and after with some very minimal cleaning efforts. Then I decided I would fill gas tank for first time as it was on "E" and I wanted to make sure it was reading correctly. I just had nozzle in until it clicked off, and did not attempt to top it off. The total on the pump was 13.6 gallons. After receiving a compliment on my "aluminum D'Loren," I noticed a gas smell. Drove it home and parked it and found a large puddle of fuel behind the passenger wheel well. I then looked up capacity and see that it should only hold 13.2 gallons. Thanks to another thread, I read how to access fuel panel. It appears to be as simple as the white plastic screw on lid being loose so there wasn't enough pressure to shut off the nozzle I guess. Hand tightened, wiped off excess and will hope for the best on the next fill up. The good news is that it looks like all new components under here. My car always smells after fill up, and I’ve seen fuel leaking in the same area you have. I’m positive it’s my fuel sending unit, but despite how much I clean and tighten it, it still leaks. Hmmm. Hooray, May '81! 1598 just went on auction here and on eBay. I think it ended up in Europe. Drove the living crap out of her the last couple of weeks. Acceleration and overall performance has never been better now that I have the throttle body restricted down to the correct diameter. Megasquirt does the rest and does it well. I was interested in my MPG even though I drive pretty 'aggressively'. Last tank was 18.6, so not terrible. I notice that I still have acceleration a little richer than I need it to be and I can defuel a bit more on deceleration. I can get this to 20mpg or so without any performance degradation I'm sure. If you're tired of the expense of K-jet maintenance and want to modernize for the next 40 years of the car's life, go EFI. Laptop tuning and never opening the engine compartment are sweet!!!! !